Group portrait of sisters and matron of the AANS. Identified left to right, back row: Sisters (Sr) Scott; Millie Alberts; Eliza Maud Hannam; Smith; Perkins; (? ; (? Daisy or Christina May) Wearne; Evans; Murphy; Walker; Mitchell. Second row: Srs Parsons, Blinoley; (? Emma) Dixon; (? Adelina) Marks; Steel; O’Connell; Doyle; Bernice Margaret Collopy; Hannah Pankhurst; Walsh; Johns; Nowland; Foster. 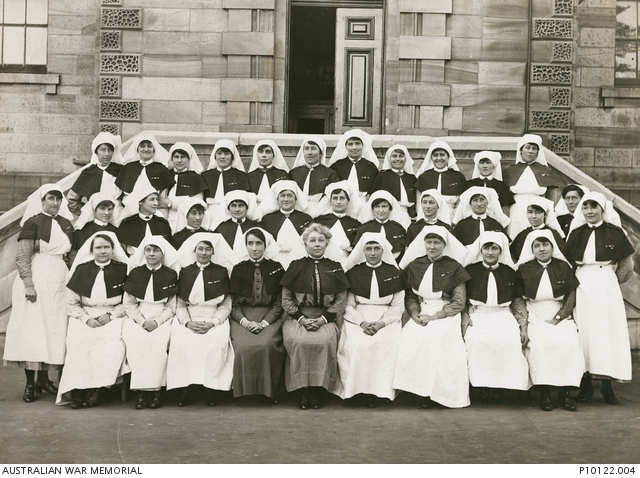 Front row: Srs E Smith; Keary; Nellie Constance Morrice; Matron Marshall; Srs Sophie Hill Durham; (? Maud) Stokes; Jones.